When I first heard about Cleo by Lucy Coats, I was really excited. The idea of a book telling the adventures of a young Cleopatra? That's pretty exciting. And I think there is a lot of possibility in this idea as well, especially as very little is known of young Cleopatra's life. It took me awhile but once I worked out where things were different to my expectations, and to separate my expectations from this book, I was able to enjoy it a lot more. This book's main character, Cleo, is a young Egyptian royal growing up in the Pharaoh's court. Her voice and character and whole demeanor isn't quite what I had in mind for a young Cleopatra. Teenage Cleo in this book is a little bit whingey and sulky and she drags her feet a little bit with the tasks she has been assigned. She seems a rather reluctant hero but I think this was mostly to balance out the 'chosen one' pressure that surrounds Cleo. I also had problems with the fact that book is set in a particular time period and yet feels like the main character is very modern in the way that she speaks. She isn't quite the person I imagine her, in my head, to be because I'm stuck on her being a young Cleopatra but this Cleo is years from being the grown-up, put-together woman from history. And that's okay. I quite liked Cleo. 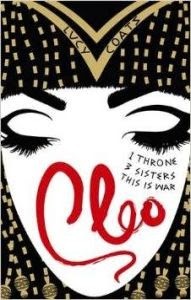 We begin this story with a big loss: Cleo's mother dies at the beginning and that puts Cleo into a very vulnerable position with her sisters who are set on taking over as joint Pharaohs and Cleo knows that she must survive. In order to do so, her and her body slave (and best friend) Charm flee to another part of Egypt and take up in a Temple of Isis before returning many years later to do Isis' will. One of the major themes running throughout Cleo is the idea of faith and a belief in gods and goddesses of this time period. I really enjoyed Cleo's questioning of her faith and of this religion and the ways in which this plays a huge part in her life. I think religion plays a part in many young people's lives and it is quite interesting to see it fully explored in this book. At its heart, I think of Cleo as an action adventure story. Cleo is tasked with retrieving an artifact in order to restore the goddess Isis as a major presence in Egypt and to restore the balance of power and goodness in the Pharaoh's court. Cleo does this in opposition to her two Evil sisters and under great danger. But she does have the support of her best friend, Charm, some loyal guards and the help of super-spy and hot Librarian boy, Khai. While Cleo and Khai's relationship is slightly in the insta-love domain, I loved that he is a librarian and has a great love of books. It's always nice to see two people falling in love over a shared love of books. And I also really liked Cleo and Charm's relationship. Theirs is a relationship that I fully felt invested in throughout the story and I'd love to see more of them in future books in this series. While I did have some issues with this book, I also really enjoyed it. I flew threw it pretty quickly and not only did I want to know more about Cleo's story, I also wanted to know more about the actual Cleopatra and also the environment and situations that she might have faced in her actual life. Cleo was a fun book!